Vital records document births, marriages and deaths. They are maintained by governmental agencies and are used as primary sources in genealogical research. 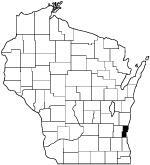 Although Wisconsin law required counties to register these events since 1852, only a limited number were actually recorded by the counties before September 30, 1907. Birth, death, and marriage certificates for events that occurred prior to 1907 are available for viewing at the Wisconsin Genealogy Index (the volume and page number are not used at the county level). You can purchase certified and uncertified copies of Ozaukee County birth, death, and marriage certificates at the Ozaukee County Register of Deeds office. I am currently going through the indexes to Wisconsin deaths records before October 1, 1907 and extracting those from Ozaukee County. They are arranged alphabetically by surname and list surname, given name, date of death, volume number and page number. When looking for records at the county courthouse, the volume and page numbers are not used. As is the case with most records, spelling and transcription errors were made when recording the information on the indexes. It is best to use all alternate spellings of surnames when searching the indexes and to view the actual records when there is a question. The indexes for the Wisconsin pre-1907 marriage records list the grooms and brides separately, so if you only knew the name of one party, you would have no way to learn who they married unless you were able to check the record itself. Glenn has not only extracted the Ozaukee County marriages from the state index, but transcribed and put them into a format where he could match the bride and groom names by using the marriage date and record sequence numbers. Please take the time to thank him for all of his hard work.